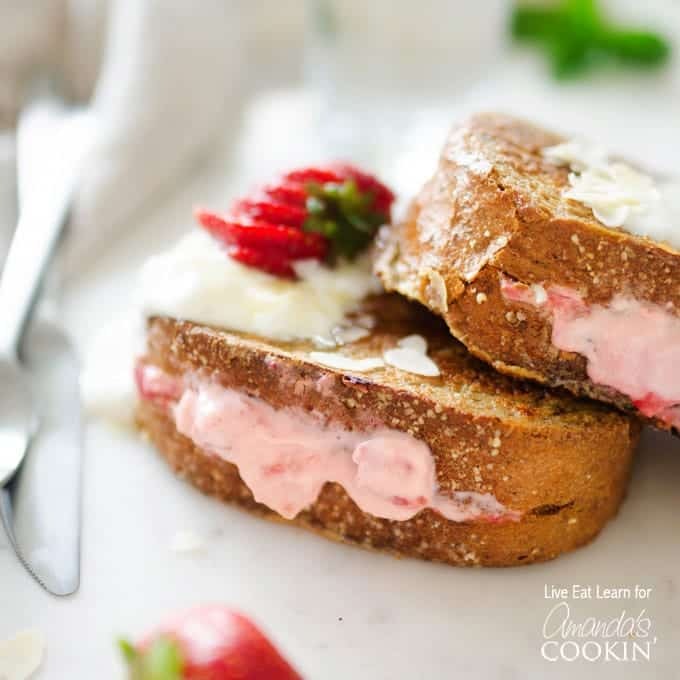 This twist on the classic French toast is stuffed with sweet strawberries and cream filling. 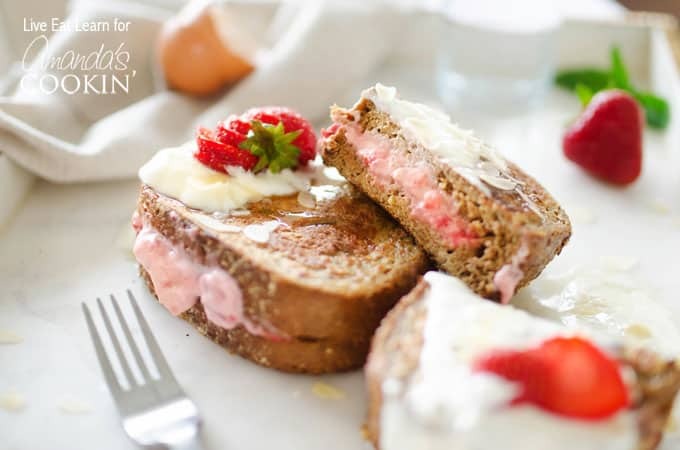 Turn your usual Saturday breakfast into something deliciously out of the ordinary Strawberry Stuffed French Toast! I get some serious recipe inspiration from my chef crush, Jamie Oliver. With a focus on healthy food and a knack for simple recipes, what’s not to love? So when my mom, who also swoons for Jamie boy, forwarded along his recipe for Berry Pocket Eggy Bread to me, I knew it’d be good. Aside from the difference in names (I’m not sure who the heck calls French toast eggy bread), today’s Strawberries and Cream Stuffed French Toast is a bit different from Jamie’s. We’re sprucing up the strawberries with a bit of cream cheese, sugar, and salt, because if you’re going to make French toast, you’ve gotta go all in. Cut a slit in a thick piece of bread and stuff it all in. The rest is good ‘ole fashion American French toast. 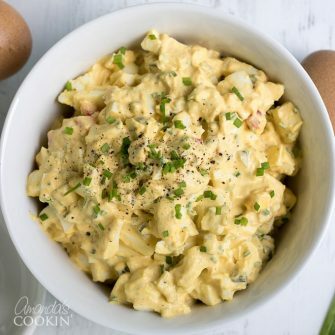 Dredge the bread in an egg mixture and throw it on the skillet! And don’t feel limited to strawberries. Whatever kind of berry you have in your fridge in the morning (blueberries, raspberries, you name it) works well too! 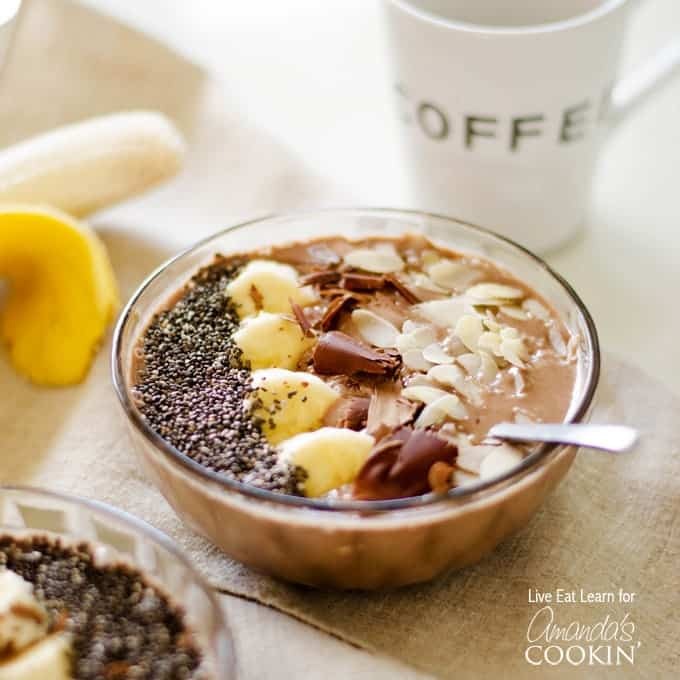 If you’ve jumped on the smoothie bowl train for breakfast these days, and you are a coffee lover, this mocha smoothie bowl is a must try! 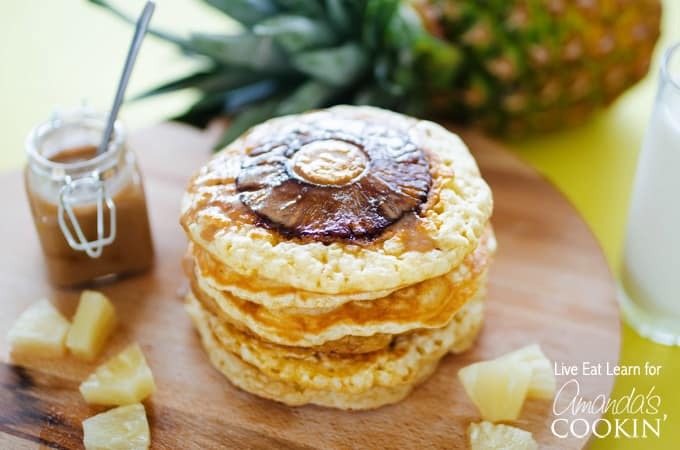 If pancakes are your thing for breakfast, try these amazing pineapple pancakes with homemade coconut syrup, you won’t regret it! 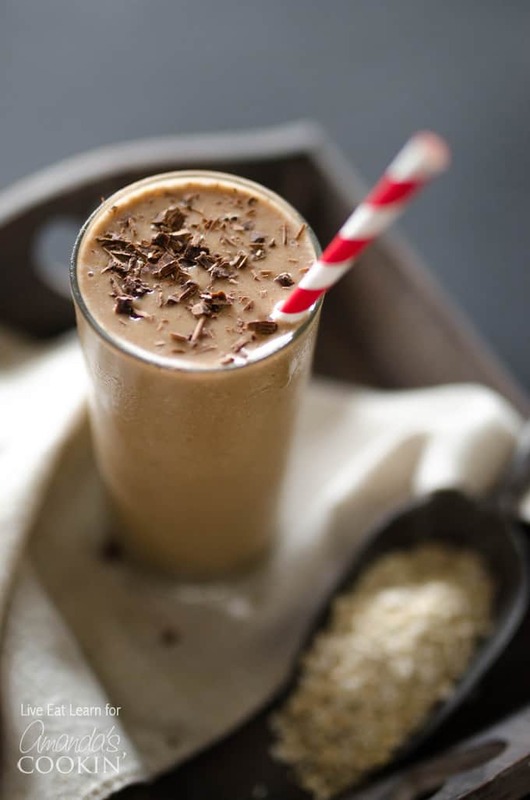 If you are in a hurry or you just like to drink your breakfast, try this loaded coffee breakfast smoothie. It will have you raring to go in no time! 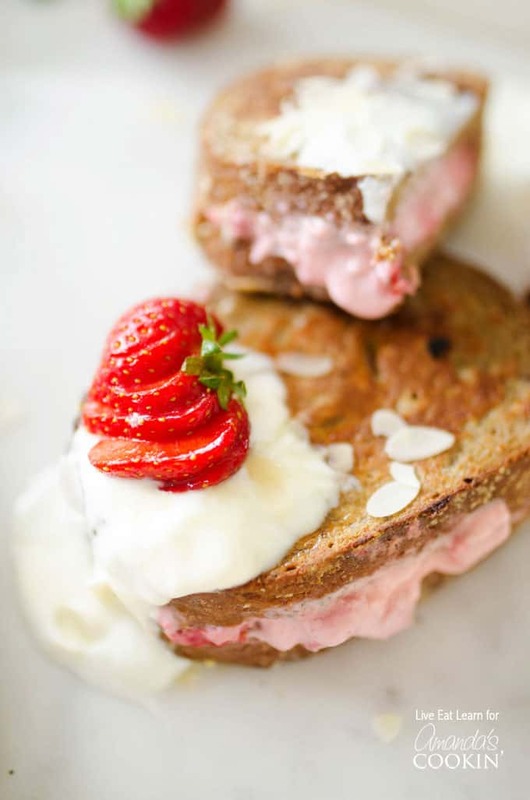 This twist on the classic French toast is stuffed with sweet strawberries and cream filling. Turn your usual Saturday breakfast into something deliciously out of the ordinary! Cut a slit in one side of the each slice of bread to form a pocket. In a small bowl, mix together the strawberries, cream cheese, sugar, and salt. Gently spoon the mixture evenly into the bread pockets, being careful not to poke a hole in the bread. In a large, shallow bowl, whisk together the eggs, milk, vanilla, and cinnamon. Gently lay each stuffed bread into the egg mixture, letting each side of the bread soak up as much egg as possible. Add a touch of oil or butter to a pan and bring to medium/low heat. Cook each side of the bread until lightly browned, about 4 minutes. Serve warm, topped with maple syrup, Greek yogurt, honey, or slivered almonds.